The Blocks 2 and 4 Odor Abatement Project (CIPID 1255.021) will address public health and safety concerns resulting from an undersized grease interceptor and deteriorating sewer lines in the Second Street District. Austin Water is proposing to build a Centralized Odor Control Facility on land at the Morris Williams Golf Course. The proposed facility will address ongoing odor complaints associated with the wastewater collection system and minimize the potential for corrosion in existing wastewater collection infrastructure. In order to maintain reliable delivery of drinking water to City of Austin customers, The Public Works Department and Austin Water are undertaking two major improvement projects within the Albert R. Davis Water Treatment Plant. These projects will upgrade and replace several electrical and mechanical components of the plant, including constructing a new medium service pump station building and electrical substation building. In April 2017, the City of Austin Public Works Department, in conjunction with Austin Water, began the Gonzales Lift Station Abandonment Project. This station has been in operation since the 1950s and is the oldest lift station operated by the City of Austin. The Highland Park Water & Wastewater Improvement Project is being planned to construct a second water line to feed into the area. The project will run about three miles from Far West Blvd. to Crestway Dr. with much of the work being done along Balcones Drive. The Main to Junction 420 Reclaimed Water Project ( ID: 5267.046) will construct approximately 6,600 ft. of reclaimed water main. The project will start on Rio Grande Street adjacent to the ACC Rio Grande Campus and end south of Lady Bird Lake at Auditorium Shores. Reclaimed water is highly purified wastewater that is ordinarily discharged to the Colorado River. Once processed, it can be used by customers for nondrinking uses such as irrigation, cooling, toilet flushing and manufacturing. Using reclaimed water helps conserve our drinking water supply. The City of Austin Public Works Department is currently in the process of designing the Meadow Lake Boulevard street extension project. The N Lamar Blvd and Burnet Rd Corridor Improvements project (Project ID: 9383.002) is funded from the voter-approved 2012 General Obligation Bond Program, with a total allocation of $15 million, supplemented with other sources, to address multi-modal corridor improvements identified in the N Lamar Blvd/Burnet Rd Corridor Mobility Report. The Public Works Department, the Austin Fire Department (AFD) and Travis County EMS are currently in the process of designing a new fire/EMS station to serve the Onion Creek area. Construction is slated to begin in winter 2017 and the station will be located at the intersection of FM 1626 and Old San Antonio Rd. The addition of this station will aid AFD and Travis County EMS in improving response times to accomodate growth and annexation along the southern fringe of Austin. In March 2016, the study phase for the replacement bridge at Redbud Trail over Lady Bird Lake began. This project has been years in the making and is the result of increasing strains on the bridge due to flooding, population growth, the number of vehicles on the road and heightened use. The Sabine Street Promenade project, located along Sabine Street between 4th and 6th Streets, gives priority to bicyclists and pedestrians by creating a festival street atmosphere. In September of 2017, the City of Austin's Public Works Department, in conjunction with the Austin Water Utility, began the Tanglebriar Water System Improvements Project. This project will involve making the improvements necessary to convert the Old Anderson Mill water pressure zone. The West Allandale Water Improvement Project is part of Renewing Austin, an Austin Water program to replace and upgrade aging water lines. The pipes running below our streets carry the very lifeblood of our community, but aging water infrastructure can be a major problem. Austin Water is protecting our city's water infrastructure by investing in upgrades and repairs of the existing water lines, as part of the Renewing Austin program. Austin Water is in the process of developing the Preliminary Engineering Report (PER) for the Williamson Creek Interceptor Project. 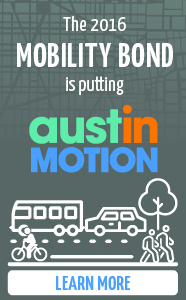 Construction isn’t slated to begin until 2019; however, staff from the City of Austin’s Public Works Department and Austin Water would like to meet with neighbors in the project vicinity to discuss potential project impacts, route options, and the overall project purpose.